JNN 10 Oct 2014 Delhi : Leaders at the Karbala Mosque in New Delhi said 200,000 people across India – including Sunni Muslims, Christians and Hindus – had registered their interest to volunteer in Iraq since June. Coordinator Bilal Hussein said in the first instance they would send volunteers with practical skills – like medicine or engineering – to help those in need, and also spread the message that the Islamic State group did not follow Muslim beliefs. “We want to show them that Islam gives you the message of love – not picking up arms and killing people,” he said. Mr Hussein said he had heard reports that several Shia shrines in a number of cities in Iraq and Syria had already been destroyed by militants. “We would form a human chain around the shrines and if they want to desecrate the shrines, they have to go through us first,” he said. Abbas Naqvi, who will be among the first volunteers to go to Iraq, said he was not scared of becoming a human shield. “Everybody wants to sacrifice their lives,” he said. Tatheem Fatima is only 12 years old, but she is well aware of the horrors afflicting her fellow Shia Muslims in the Middle East, thousands of kilometres away from her home in New Delhi. “They are killing our people. They are killing all those going for the holy pilgrimage,” she said. 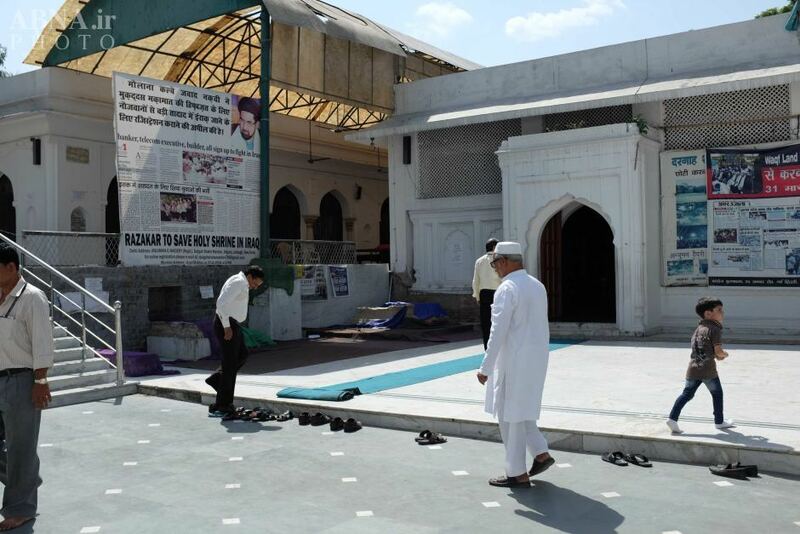 Videos and smart phones have brought the conflict in Iraq and Syria to many parts of the world, including to Ms Fatima’s mosque in the Indian capital. Many of the devotees here – including children and teenagers – have images and videos on their phones of Islamic State (IS) militants murdering civilians, and Shia shrines being desecrated. Ms Fatima said indiscriminate killing went against her religion – and said she would do anything to stop IS. “I want to go there; I want to kill them,” she said. IS strongholds in Iraq and Syria are thousands of kilometres away from India, but there are growing concerns the insurgency is making inroads into South Asia. The Pakistani Tehrik e Taliban Pakistan ( TTP ) Terrorists have already pledged their allegiance to IS and there are unconfirmed reports that men brandishing IS flags have killed and beheaded people in Afghanistan’s east in recent weeks. Authorities believe several dozen Indians have gone to fight with the terrorist group and that more could be recruited. “There is a lot of unemployment here, including among the Muslim youth,” retired Indian intelligence officer Jayadeva Ranade said. “In a lot of these recruitment pitches that these terrorist groups make they offer them monthly payments as well as payments to their families in case anything happens to them. Mr Ranade said tracking fighters who returned to India would be difficult. “India is a free country – a very free country. There are no restrictions on mobility. People can go anywhere,” he said. “So once they come back, the difficulty will be not in assessing whether they are back or not, but after that where they move. IS has purportedly named places in India where it plans to recruit from and has declared the entire country as part of the ‘caliphate’ it intends to create. This entry was posted in Jafria and tagged Bilal Hussein, Iraq, Islamic State, Syria. Bookmark the permalink. THE FIRST & FOREMOST THING IS THEY MAY BE CALLING THEMSELVES AN ISLAMIC STATE , WHICH THEY ARE NOT. IRAQI’S HAVE IRAQI NATION, SYRIANS HAVE SHAAMI , IF SOME KAFFIRS, NON MUSLIM THUGS HAVE USURPED SOME AREAS BY BRUTAL FORCE , THEY HAVE NOT ESTABLISHED KHILAFAT , THEY HAVE ONLY INVADED SOME POCKETS AND SHOULD BE REPELLED . I SOLUTE THE NON SHIA VOLUNTEERS WHO HAVE OFFERED TO FIGHT THE EVIL FORCES OF SO CALLED ISIS / ISIL . THIS IS THE MOST NOBLE HUMANATARIAN OFFER FROM INDIAN SUNNI MUSLIMS , HINDUS AND THE CHRISTIANS . IT SHOWS HUMANITY STILL SURVIVES IN INDIA DESPITE SOME VERY ABNOXIOUS HAPPENING THAT UNFORTUNATELY HAPPENED A DECADE BACK ..
To any Christians volunteering to fight against IS: please do not kill unnecessarily, do not kill if it’s not in defense of life, do not kill Islamic fighters you capture. Just blind them and send them back to their compatriots. This will hamper their manpower and logistics because they will need to care and feed them, or their fighters will become demoralized if the IS leadership orders them not to. They also make poor suicide bombers and IS may not waste suicide vests on these essentially useless fighters. Most importantly, letting them live may allow them to learn (in their solitude, or from human compassion) of the true God who does not like the destruction of the life and intelligence He created — and that includes everyone.